A versatile program, the standard version of eBay’s Selling Manager allows you to monitor or automate many of the more tedious eBay tasks. The page is broken into several boxes, which are broken down here. We all like to know how we’re doing, and the At a Glance area allows you to do just that. 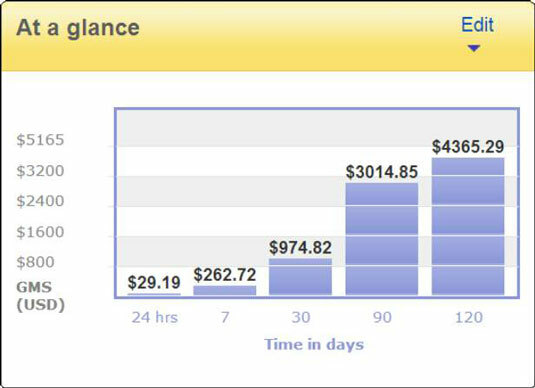 A bar chart that shows a sales summary for the last 24 hours, last 7 days, 30 days and last 120 days is integrated with eBay so there’s no lag time from selling to viewing. 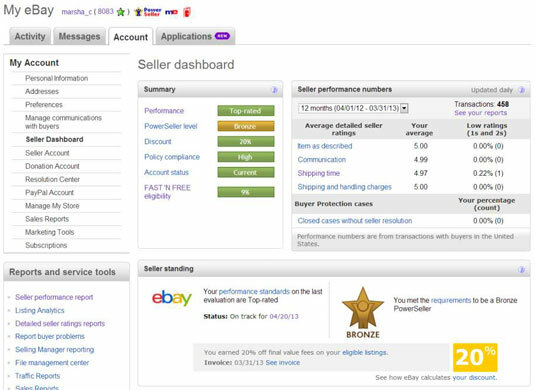 Available to sellers once they have received ten Detailed Seller Ratings, the Seller Dashboard Summary box gives you a quick way to check your status on eBay. 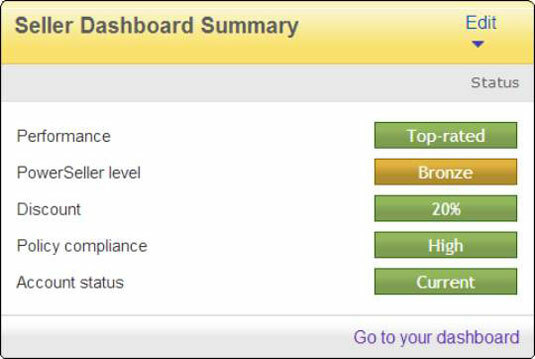 The Dashboard Summary covers the all-important results of the DSR ratings you get from your buyers. It also keeps you apprised of whether you’re following eBay’s policies or, instead, have violated any in the recent past. If you’re a Top Rated Seller Plus, you also see your DSR-based Final Value Fee discount as well as your PowerSeller level. At the bottom of the Seller Dashboard Summary box is a link that will take you to your official dashboard. Here you can find out the details of what makes you a good seller in eBay’s eyes — and in your customers’ eyes, too. An important box on the Selling Manager Summary page is Listing Activity. You’ll get some valuable information there. It references what you did — or didn’t — sell, along with even more stats on your sales. Click the Active Listings link on the Summary page, and you can observe the bidding action just as you can from the my eBay Selling page. The color-coding that indicates auction bidding activity is the same as on the my eBay Selling page. Your listings are accessible with a click of your mouse. You have the option to sort and see only auctions or fixed-price listings on the Active Listings page. You can also search your own listings by keyword or item number. You can access your Unsold listings from the links on the left side of the page. But the important link here is the link to items Eligible for Relist Fee Credit. This link will conveniently take you to the listings that you can relist, and if they sell the second time, eBay will refund your initial listings fees. You need to know that to be eligible for relisting credit (once you have exceeded your free listings), the item gets only one shot at reselling. If it’s been relisted twice, you need to start the listing again by using the Sell Similar link. The Sell Similar link starts the transaction in a new cycle for the sale, thereby making it eligible for the relisting credit if it doesn’t sell. The Scheduled Listings link on the Summary page takes you to any auction or fixed-price listing you’ve asked eBay to begin at a later time or date (or through Turbo Lister). You can also view these pending listings through links that narrow them to listings that start within the next hour — or start today. When you enter the Scheduled Listings area (by clicking the Scheduled Listings link), you can go directly to any of your listings. If you want to promote your listing-to-be in a banner ad (or create a link to it from elsewhere on the Internet), you can do so using the URL of the pending listing. From the Scheduled Listings page, you can confirm all information about the sale, as well as make any changes to the listing or to the scheduling time. Awaiting payment: This is where items that have been won or bought are shown before a payment is made. Buyers Eligible for combined purchases: Here you’ll see when a buyer buys more than one item from you and you need to combine the items into a single invoice. Otherwise the buyer may pay you once for each transaction — and then you’ll incur extra transaction fees from PayPal. Also, combined purchases help if you want to give your good customers a break on shipping. Awaiting Shipment: When a buyer has sent payment through PayPal, the transaction automatically moves to this category. Paid and Shipped: After an item is paid for, a reference to it appears here so you can keep abreast of the feedback you need to leave. When you’ve shipped an item and posted your tracking number, you can also check to see when the item is delivered. Resolution Center: This is where you turn in non-paying buyers and see if a buyer has opened a complaint on one of your transactions. Scroll down the page and you’ll see the Seller Tools box on the left side of the Summary page. It’s a powerful group of links that allow you to download and export your sales history to your computer. You also have quick links to PayPal, Multi Variation Merger, your eBay Store, and to the good old my eBay Selling page. 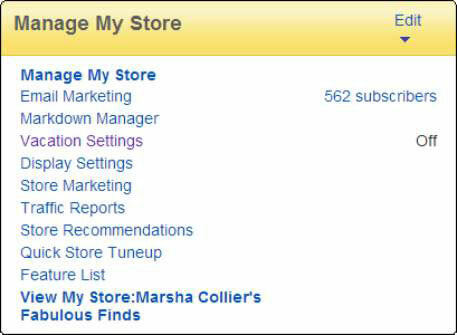 If you have an eBay Store, you’ll see a box on the Selling Manager Summary page with all the links you need to manage your store. You can access reports, e-mail marketing tools, Markdown Manager, and more. Also here you will find the all-important Vacation Settings to take your listings offline if you need a break.